2008 TC3 is the first minor planet to be discovered and then found to be on a certain collision course with Earth. It was very well observed on its approach and impacted in northern Sudan 20 hours after discovery. This page brings together information from various sources, including Great Shefford Observatory. Links to the original material are given where available. 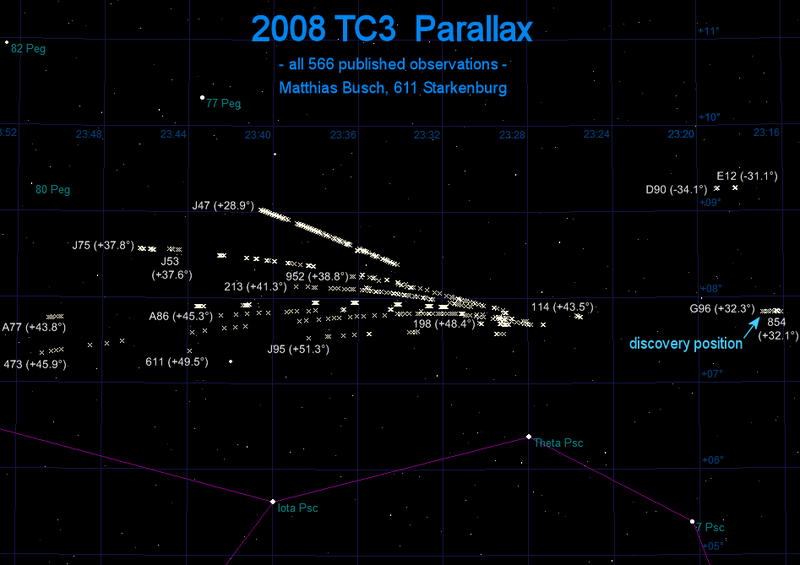 2008 TC3 was discovered at 06:39 UT on 6th October 2008 by Richard Kowalski working with the 1.5-m reflector of the Mt. Lemmon Survey and was posted on the Minor Planet Center's NEO Confirmation page an hour later. The survey team released an animation of the four discovery images, showing the object moving east to west in a field of view just under 6'x6' in size, with a gap of about 15 minutes between each frame. It was moving on the sky at about 6"/minute at magnitude +19 and was already only 1.25 Lunar Distances (L.D.) from Earth, or 480,000 Km. It was followed for about 2.5 hours from Mt. Lemmon (G96) and also by James McGaha at Sabino Canyon Observatory near Tucson (854). From the 15 positions obtained it was already obvious that a very close approach was in progress, with an impact possible. An orbit I determined using FindOrb at around 13:00 UT gave close approach at 01:50 UT on 7th Oct 2008 at a distance of 5,986 Km (Earth equatorial radius = 6357 Km). At 13:39 UT I emailed the Minor Planet Center (08:39am local time) to make sure they were aware of this possibility and at 13:54 UT Bill Gray (the author of FindOrb) had posted message 21070 on the Minor Planet Mailing List (MPML) with very similar findings and estimated the chance of collision with the Earth at 90%. "The nominal orbit given above has 2008 TC3 coming to within one earth radius around Oct. 7.1. The absolute magnitude indicates that the object will not survive passage through the atmosphere. Steve Chesley (JPL) reports that atmospheric entry will occur on 2008 Oct 07 0246 UTC over northern Sudan." Andrea Milani (NEODys) wrote at 18:08 UT on the MPML that the possibility of impact was now 99.8% or greater and that in practice a collision was "sure". 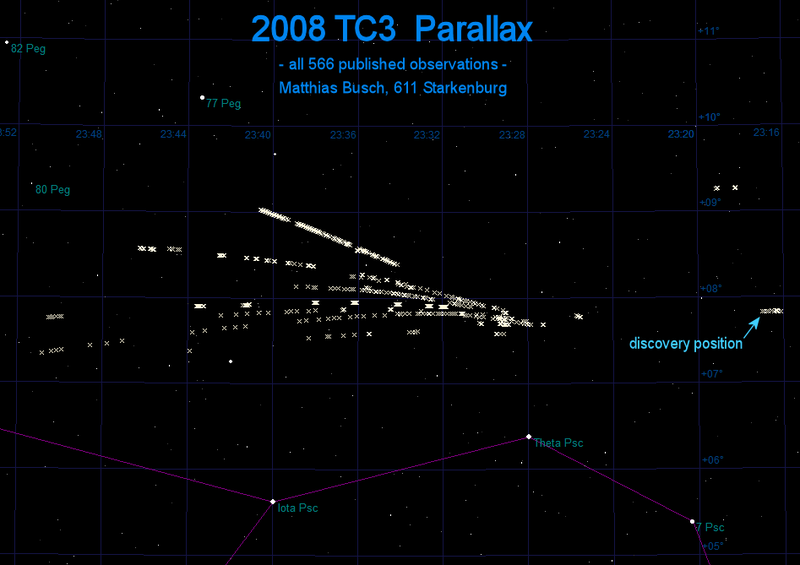 As Europe fell into darkness later on 06th Oct, 2008 TC3 was well placed for observation and many observatories measured positions and reported them to the Minor Planet Center (MPC) in near real-time. The MPC kept the NEO community up to date with the latest information with 24 updates being published in the space of 8 hours, the last less than an hour before impact. In the two animations below, the small rock is seen from Great Shefford in England, moving from West to East during brief gaps in the clouds. The apparent speed as seen against the sky background doubled in the intervening 80 minutes as it approached from 125,000 Km to 94,000 Km. Note the "twinkling" of the minor planet, caused by rapid rotation, exposing different aspects of its uneven surface to sunlight. 45 x 4 second exposures 3h 16m before impact. The images used in the animation on the right hand side are shown below, this time combined so as to keep the Minor Planet stationary, causing it to appear as a bright pinpoint of light in the centre of the field of view and making the stars trail during the 3 min 24 seconds the images were being recorded. 15 minutes before 2008 TC3 disappeared into the Earth's shadow the John J. McCarthy Observatory in Connecticut, USA managed to obtain the following images. Due to the geometry of observing from so far west, the apparent speed in the sky was 704"/min., more than double the speed as seen from Europe at the same time. Reiner Stoss, observing remotely with telescopes at La Sagra in Spain arranged for a 0.45-m telescope to follow 2008 TC3 as it disappeared into the Earth's shadow. As can be seen below, the minor planet, streaking from right to left and showing some variation in brightness due to rotation, fades completely from view as it is shaded from the Sun by the Earth. 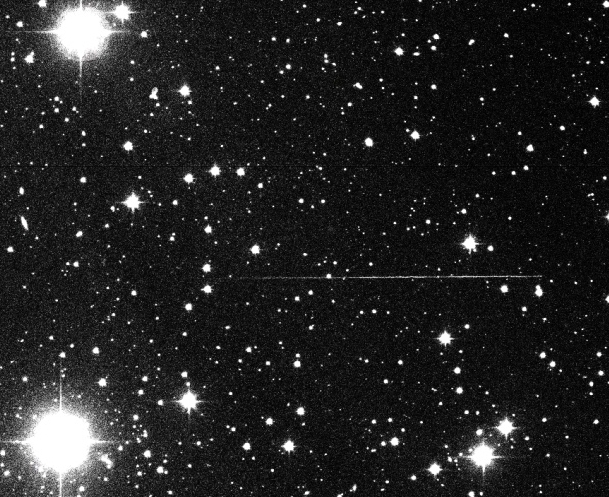 The field of view is 20'x16' and the 6 minute exposure started at 01:45:23 UT on 07 Oct 2008. 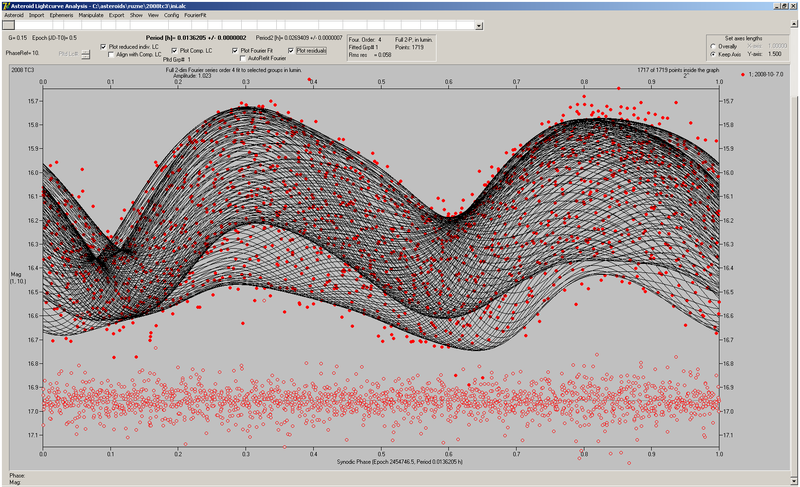 The plot below was created by Matthias Busch using the original discovery positions from USA together with the many positions reported from various observatories in Europe as 2008 TC3 rapidly approached the Earth. The effects of parallax are very obvious, with observatories in southern Europe contributing positions towards the top of the diagram and observatories in northern Europe towards the bottom of the chart. Observatory codes and their approximate latitudes have been added to the chart by Peter Birtwhistle, where the contributions by individual observatories could be made out. Mathias copyright 2008 Matthias Busch. Links to MPML post and original file. The only visual sighting of the impact? 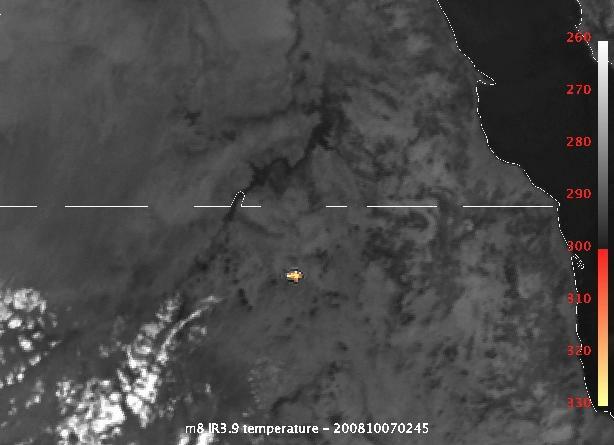 As reported on Spaceweather.com on 8th Oct 2008, General Aviation meteorologist Jacob Kuiper of the Royal Netherlands Meteorological Institute had alerted an Air-France-KLM official at Amsterdam airport that aircraft near Sudan at the time of impact might have the possibility of seeing the fireball caused by 2008 TC3 burning up in the atmosphere. Alerted just minutes before impact, the pilot and co-pilot of KLM flight 592 reported seeing distant flashes of light as the asteroid destroyed itself over Sudan. Subsequently, Jacob Kuiper contacted Airline Captain de Poorter to get his account of the sighting. Read Jacob's background to this story and Captain de Poorter's full account here or by clicking on the image below.